"We only sell what we grow ourselves"
Spring has arrived! The greenhouse is full and we are feverishly planting and seeding on a daily basis. This spring we will again be offering our own hanging baskets, veggie plants, herb plants and annuals. We are also growing a lot of cut flower seedlings for our Cut Flower business, over 80 different varieties! 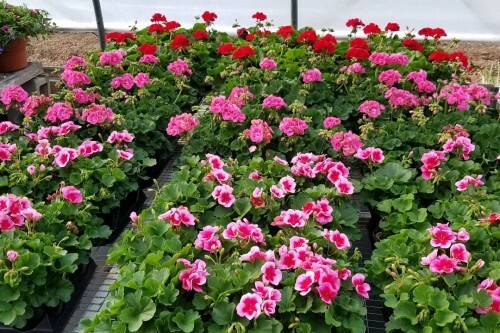 In the meantime, rest assured that we will be back at both the South Windsor Farmers Market and the Collinsville Farmers Market this coming summer in addition to offering our Cut Flower Club. Order forms for the Cut Flower Club can be found here on the website, click on the Experience and then download and print the form to be mailed in. The Cut Flower Club is entering its 10th year and our numbers keep growing! We are so thankful that you appreciate locally grown flowers! How it works: For 8 weeks during the summer, you drop by the farm and pick up your fresh cut, locally grown flower bouquet. Pickups are on Wednesdays between 4-6:30 pm.